Lens Description: The Canon EF 28-90 mm f/ 4-5.6 USM is a very compact standard zoom lens for Canon EOS film and SRL cameras.rnrnIt features a very reasonable price-quality relationship.rnrnIt can be easily mounted on both FF and APS-C cameras. In case with APS-C cameras the equivalent focal length is 45-114 mm.rnrnIt has a very convenient range of focal lengths (especially on FF cameras) and allows you to shoot a variety of scenes and subjects from landscapes to portraits.rnrnThe Canon EF 28-90 mm f/ 4-5.6 USM is equipped with a built-in USM and really features very fast and accurate focusing.rnrnThe lens generates a rather sharp, especially at the center, picture with good contrast and natural color rendering.rnrnThe optical scheme utilizes an aspherical element. Baring in mind the lens price, aberrations are well corrected. Distortion and chromatic aberrations are almost negligible..rnrnThe lens features quite good macro capabilities. Minimum focusing distance is just 38 cm. Max. 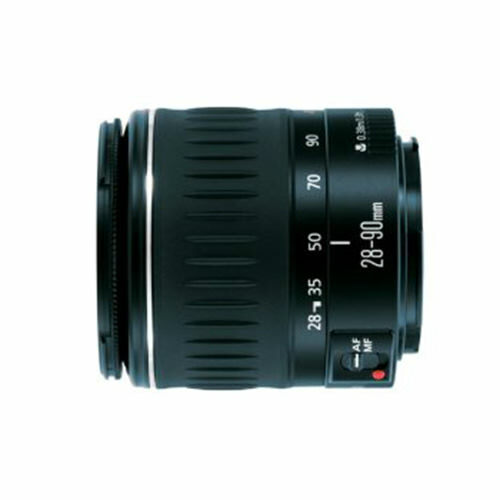 magnification ratio is 0.3 at 90 mmrnrnThe Canon EF 28-90 mm f/ 4-5.6 USM is a good choice as a kit zoom lens for beginners.